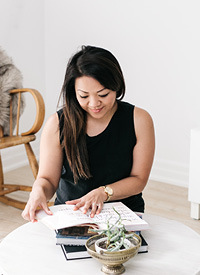 Thrifted Thursday with Pam of Cherish Toronto — Love On Sunday Love On Sunday | Interior Styling in Toronto and the GTA. Thank you so much for inviting me to participate in your Thrifted Thursdays series. Thrifting is one of my favourite past times, and I have found a lot of great things over the past couple of years, but one item really stands out as my BEST find. Where is this piece from? I found this dresser at Value Village, specifically at my favourite location not far from my office. I just happened to pop in one day during the lunch hour and it turned out to be my lucky day! What drew you to this piece? At first I didn’t recognize this piece as being a great score. Although the dresser had the telltale brass accents, all of the handles were missing. Imagine how excited I got after opening the top drawer to find the manufacturer’s original hang tag and a brown paper bag containing all 12 handles neatly wrapped in tissue paper. This piece was brand new!! I ran to the nearest employee and told them not to sell the dresser to anyone else, it was SOLD. Describe any work you did to give it new life: I didn’t do any work on the dresser for 9 months because I was in limbo about what colour I wanted to paint it. Once I settled on a rug for the living room, I was finally able to choose a paint colour by pulling inspiration from the rug’s pattern. I went with Blue Box from Para Paints, and I couldn’t be happier with the results. I lightly sanded the dresser, primed it, gave it two coats of paint and finished up with five coats of Minwax Polycrylic gloss to protect the finish. How do you use or display the item: I use the dresser as an entertainment and storage unit in my living room. The tv sits on top while the DVD player and Wii are hidden in the top drawer (I cut a hole in the back to run the wires). With so many drawers I am also able to stash away all of my DVD’s, CD’s, games, camera equipment and extra candles. Bonus: The small table to the left of the dresser was also thrifted from Value Village, I just sprayed it gold to freshen it up! Also, the brass candlesticks in the photo were found at the Salvation Army Thrift Store. So many great finds!! What do you think folks? I say this is a pretty amazing find! I love how Pam went with a bold colour, it really makes the dresser a nice focal point in the room. I'm also in love with her rug, the colours are beautiful and it ties everything together so nicely! And lastly, those bonus items? I love how she threw those into the mix as well - those brass candlesticks are perfection. I want a pair! If you haven't already, make sure to check out Pam's Blog, Cherish Toronto. She also has a cool DIY for faux bamboo bedside tables. Check it!